Starting from Monday 20 August, ITS will be carrying out weekly file system maintenance at 5am. You may notice a brief outage of up to 2 minutes at 5am while accessing files stored on your network drives and applications may be slow. 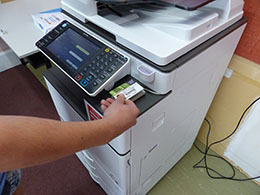 You can print a job from a UC computer, go to any Card Scan printers around UC Libraries and computer workrooms and use your Canterbury Card to print at that location. Look out for: the Coming Soon Follow-You Printing posters around the UC Libraries and computer workroom Card Scan Printers. Read on for videos, printing and photocopying rates and how your Canterbury Card will work. The Card Scan Printers (also known as Multi-Functional Devices – MFDs) in the student areas will be enabled for Follow-You printing progressively from Monday through to Wednesday. As they become available out of order signs will be removed and How To instructions will appear. These will take you through registering your Canterbury Card the first time you use it. As soon as the new system is live you will receive an email with links to more information including the new Canterbury Card Account web app that will give you details about the cost of unreleased print jobs in your Follow-You queue and reports on your transactions. On the Follow-You Card Scan printers your card balance and the cost of the current job appear on the panel so you get instant feedback!